Burlap rectangle storage bin. 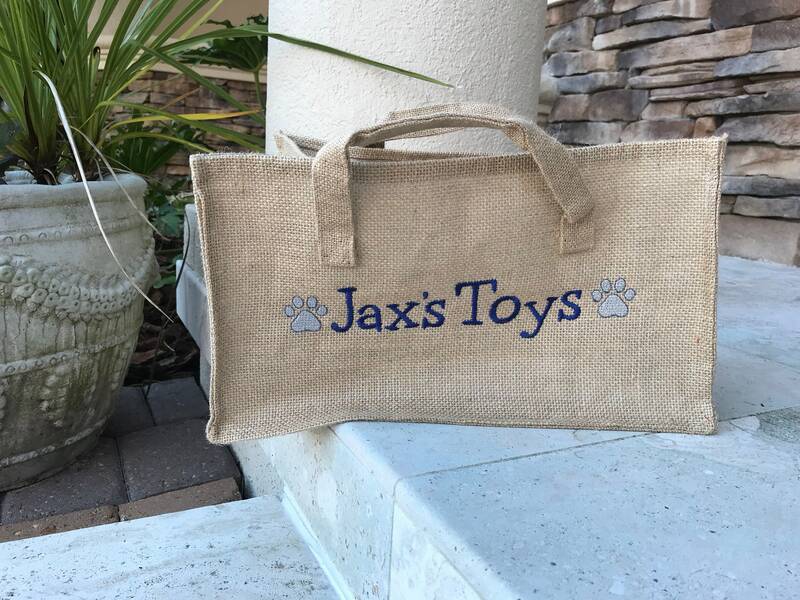 14.5" L x 9" W x 8" H. Completely customizable for your pet. 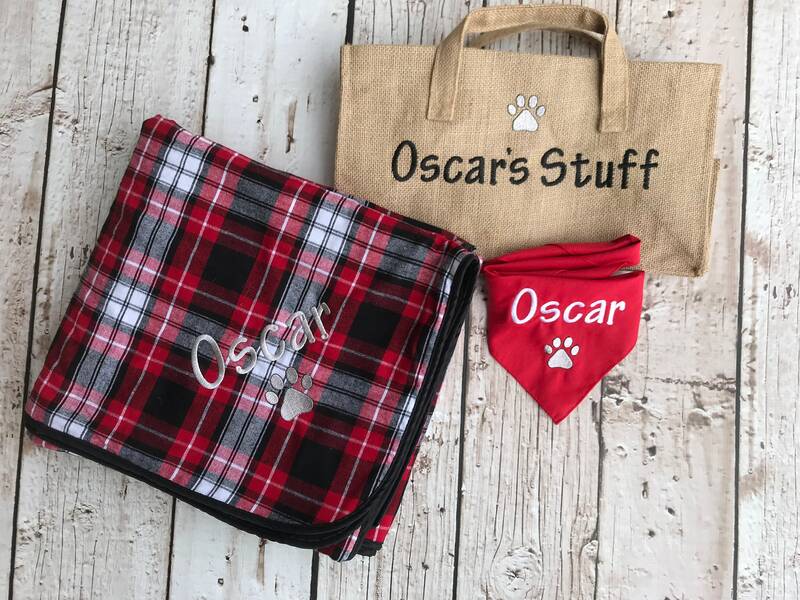 Shown Photo 1 - Large bin in the background with Arnold's and Honey's stuff in black thread/Beverly font and 2 paw prints and "Weezie" Pretty in Pink Font/Hot Pink thread. 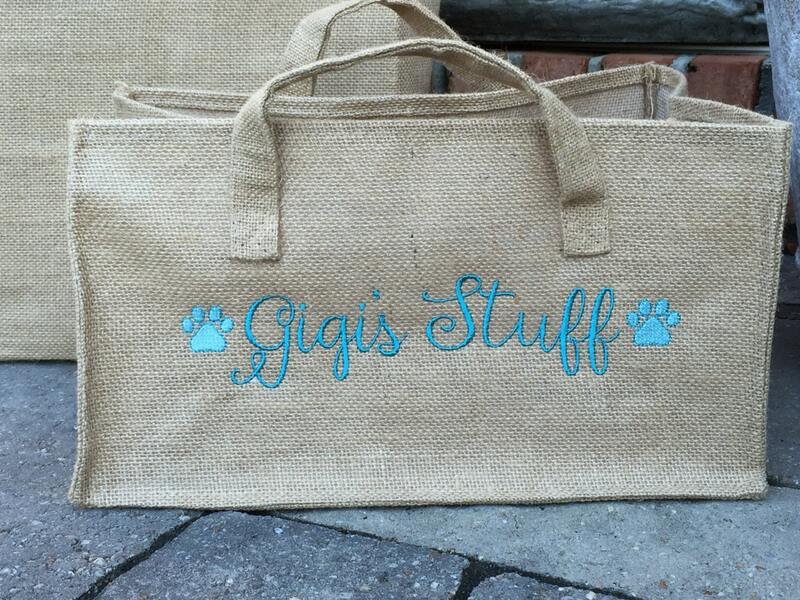 Photo 2 - Gigi's Stuff: Beverly Font/Teal thread and 2 small paws in light aqua thread with teal outline. 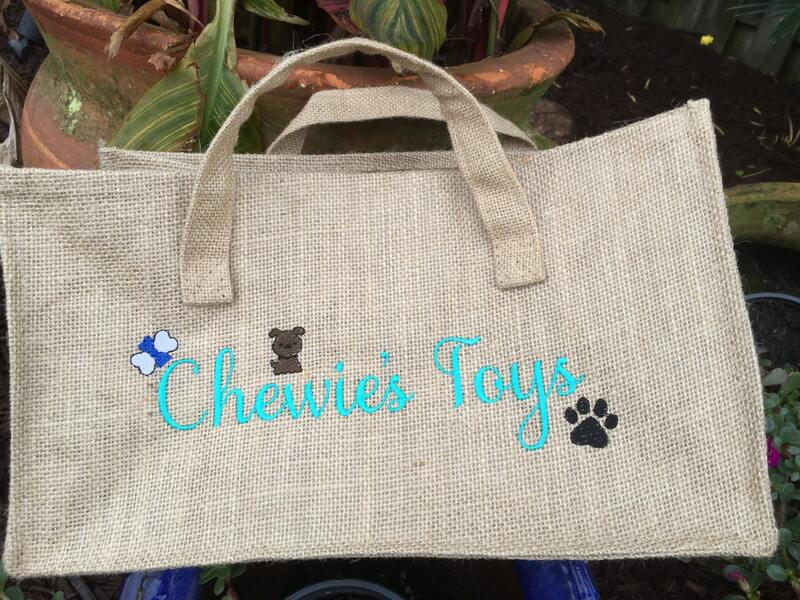 Photo 3 - Chewie's Toys: Buttercup font/Aqua thread with a paw print. bone and a small dog. 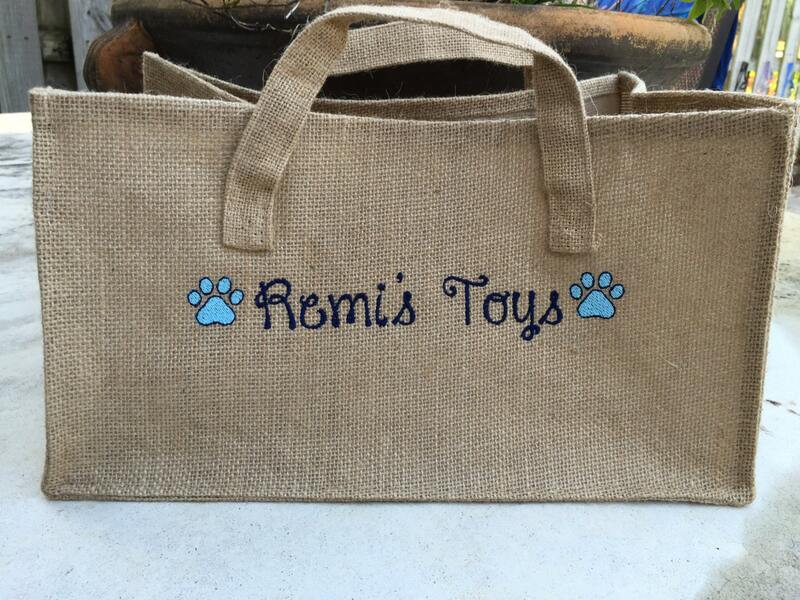 4 - Remi's Toys: Happy Day Font/Navy thread with sky blue paw prints. 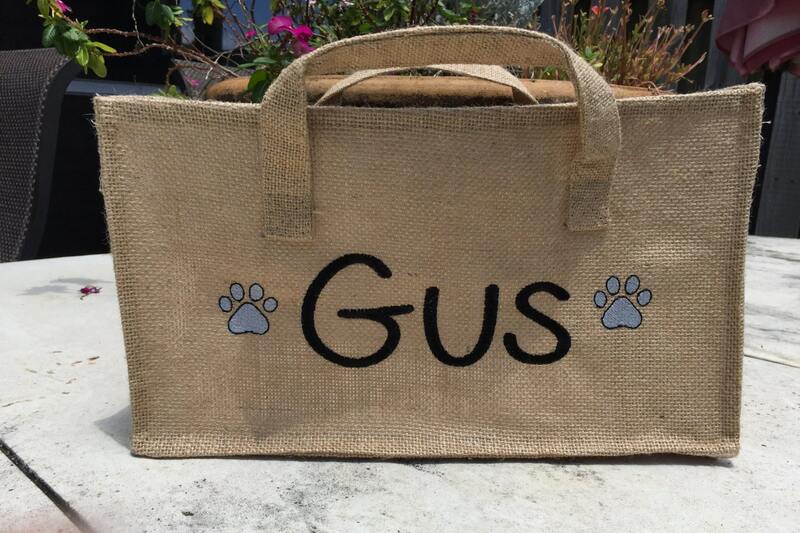 5 - Gus - Savannah font/black thread and med gray paw prints. FREE add-on icons - paw print, bone, bone with bow, dog house, small dog, flower, fleur-de-lis or crown. If you have any questions before you order, convo me and I can send you a photo of your design before I stitch it. Thread color - I have too many thread selections to mention. I have listed the most popular. If you have a particular shade you want, please ask and I'll send a photo of the colors I have in that shade. Brighter shades show up better on burlap. Payment is expected when the order is placed. I accept PAY PAL and ETSY direct checkout. Orders are not started until payment is received. Cancellation of a personalized item is NOT accepted. If you have questions about anything pertaining to your order such as sizing or thread color, message BEFORE you place your order. Shipping is handled through the USPS. I offer many different methods to get the best possible shipping rates. Choose the method and time frame that works best for you. Personalized items are NOT refundable. Exchanges will be considered for the same item if there is an obvious manufacturer defect of the product that prevents it from working the way it was intended. Shrinkage from machine washing and drying is NOT a defect. Double check your order! Mistakes can happen so carefully look over your monogram selection to make sure your monogram text is correct and entered in your preferred sewing order. Initials are usually sewn in this format: First name initial, LAST name initial and Middle name initial. Lee Ann Smith = LSA.